Many years ago I worked in Bangalore, India. My best friend and I lived close to each other so we travelled to work together. On our way back home we had to pass by the vadai man on Mosque Road. There is nothing more intoxicating than the smell of deep fried vadais wafting in the air at 6:30 in the evening. We could not resist the temptation. Hot vadais wrapped in a piece of newspaper never tasted better. It had a crispy exterior and a soft center bursting with a fusion of flavors – onion, garlic, ginger, chilli, mint, cilantro and cinnamon. Those were the good old days when these simple pleasures kept two young girls giggling and happy! Vadais are often served at tea time and as an accompaniment to a meal. They are made with different types of legumes and lentils. I have used split Bengal gram for these vadais. You will find split Bengal gram at an Indian grocery store. Split Bengal gram is a relative of chickpeas and it is used to make dal and savory dishes. It is also roasted and ground to make Bengal gram flour (besan) which is used to make various sweet and savory Indian dishes. 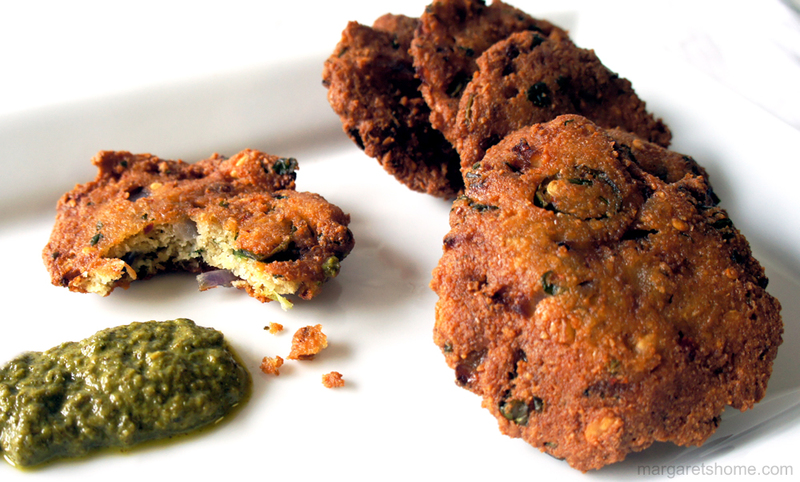 Try this recipe and I hope your vadais and chutney turn out beautifully! Wash and soak chana dal overnight. Drain well and remove two tablespoons of dal and set aside. In a blender grind coarsely the dal, chilli flakes, cumin seeds, and cinnamon powder without water. Do this in two batches and it should not be ground to a paste. Remove into a large bowl and add the rest of the ingredients except the oil. Add the two tablespoons of dal that was set aside and mix well. Heat oil in a wok and keep it on medium-high heat throughout the frying process. Make balls, using about three tablespoons of the vadai mixture, and flatten each one to about two inches in diameter on the palm of your hand. It helps to wet your palm and finger tips slightly before you form each vadai. Slide each vadai gently into the hot oil. Make four to five vadais at a time. Fry until golden brown on bottom, about three minutes. Turn and continue frying until golden brown on second side, another three minutes. Drain on paper towels. Repeat with the remaining vadai mixture. Serve with cilantro and mint chutney. Put all the ingredients in a blender, and purée. Serve with vadais. This entry was posted in Snacks, Vegetarian and tagged snack, split Bengal gram, tea time, vadais by Margaret Christo. Bookmark the permalink. Didn’t see you in church today. Looks like you did not come. How are you doing? Do you still have to go to the World Bank? Tomorrow night is Spicer barra khana in our church. Hope you will come. us of our memories. Good luck & God bless. I’m happy that at least one person remembered the vadai man besides me! Thanks for visiting my blog. Would love to hear your comments again. Have a wonderful weekend and God bless.